The Rugged 2U Server Chassis provides flexible configuration to suit your needs. This Sever Rack Component is a 2 U form factor rack, with 1 optical drive bay, removable hot plug fans for easy servicing, a 2 x 500W redundant power supply, 4 ethernet plugs, front and back USBs, and HDD Bays, and pictured components. 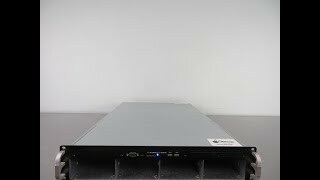 This Rugged 2U Server Chassis has been inspected for integrity and is in great condition, powers on without issue. All of our lab equipment comes backed with our standard warranty. Should you have any questions, please don't hesitate to contact us.